If you’re looking for an affordable, heavy duty, no nonsense patio swing that is perfect for outdoor use, the Abba Patio Outdoor Swing Hammock has you covered (literally). 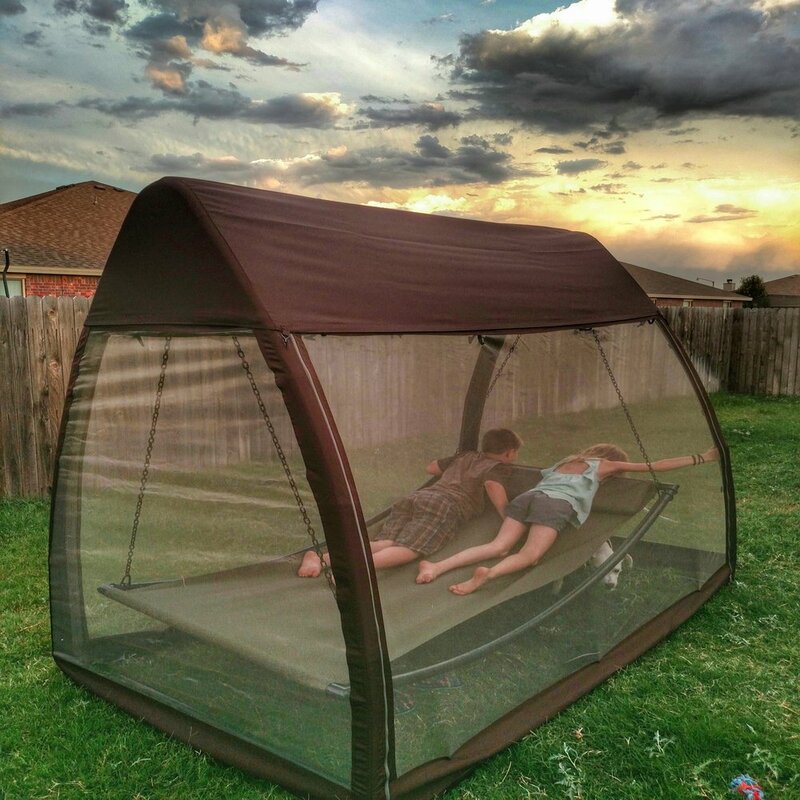 Not only does it protect you from those buzzing insects, but it lets you relax in the comfort of one of the best covered hammock swings for those perfect summer nights. Right out of the box you’ll notice that a little assembly is required for this unit, but fear not, it’s not difficult at all. The pieces are divided into a few different sections, none weighing more than 10 lbs., making them easy to move around before assembly. You may want to have a helper during assembly as once you get the larger pieces installed you’ll need to push them around a bit for the perfect fit. It took us right under two hours to fully assembly the Abba Patio Outdoor Swing Hammock from start to finish and no tools were required. 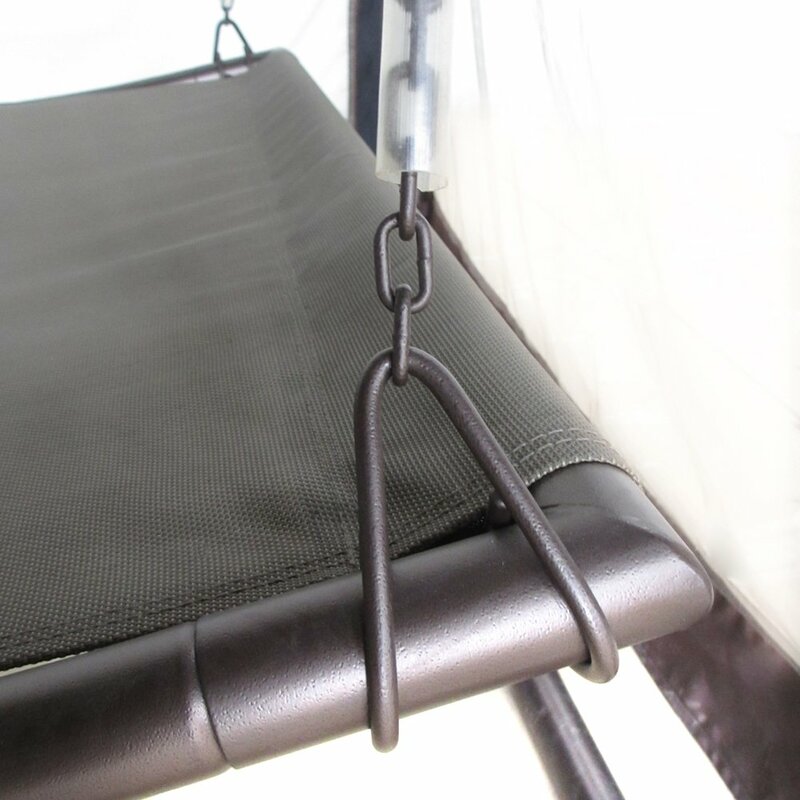 Once setup, you can easily see how high quality this hammock swing is with its robust steel legs, thick, yet springy fabric and extremely stable support. We sat on the Abba Covered Hammock Swing for a bit to rest and were pleasantly surprised at just how comfortable it was. We didn’t notice any pressure points on the hammock itself and the 300 lb. weight capacity was more than adequate. Another great thing to note was the covered hammock swing did not shift as we put weight on it, making it ideal for people who like to “fall in their hammock,” we know we do! Speaking of falling in the hammock, the Abba Covered Swing Hammock is a bit lower to the ground than most units meaning it’s a bit harder to sit in as your legs will be pushed up. The reason for this is to ensure the stability of the unit, however if you have bad knees or trouble standing up you might want to opt for a different covered swing hammock with a bit higher elevation. As the afternoon progressed we finally got around to installing the bug netting and boy is this thing roomy! Once assembled we felt like we were in an outdoor palace and were king of the backyard. We did notice that the zippers were a little finicky when trying to close the bug netting but not a huge problem. A better design might have used Velcro instead, but again it’s not something to worry about. Once we were protected in our personal bug free zone we did a quick look at the netting and were not able to find any rips or tears. 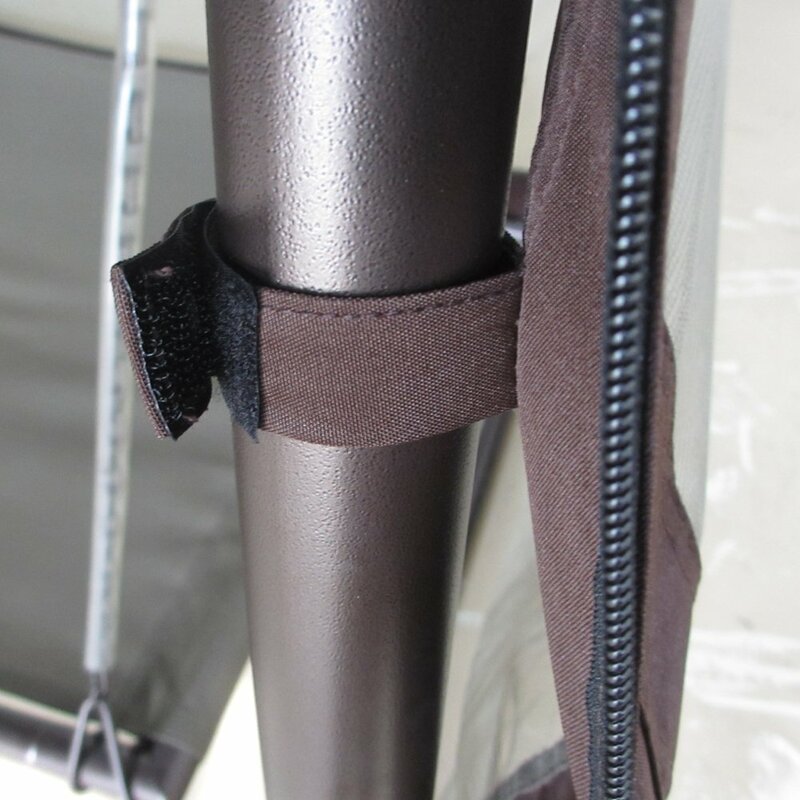 Also if you want to stay a bit more connected to other around you the bug net easily comes off with the attached Velcro wraps that go around the hammock frame. 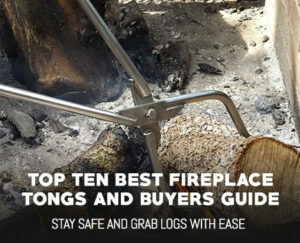 This lets you remove it in a snap if there are no bugs around or if you want to get a bit more heat from your fire pit. Features like this are often times overlooked but they can make the difference if you want a covered patio swing hammock that is flexible for all occasions. Something we did notice that can’t really be fixed without moving into a tent is the covered hammock swing bug net touches the ground and does not wrap around. This means if there is a super determined mosquito they might just find a way in. During our testing we did not have any such invaders, but then again, mosquito season is almost at an end so perhaps we were just lucky. 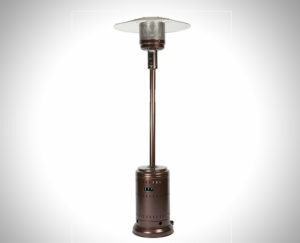 Size wise this unit is perfect for any Outdoor Mancave, backyard, RV, or camping site. 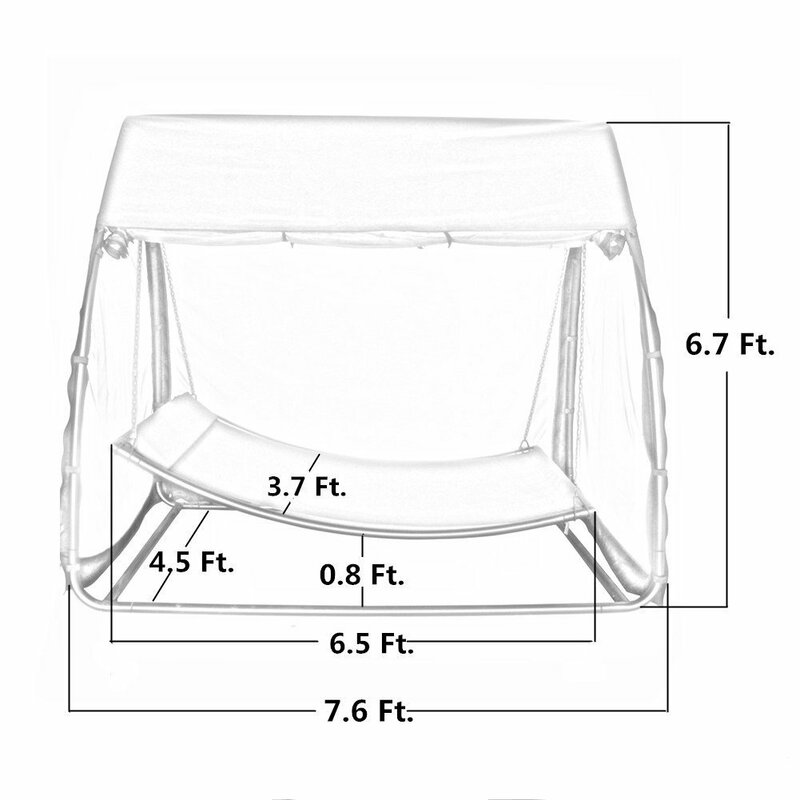 The Abba Covered Hammock Swing measures in at 7.6 ft. long, 4.5 ft. wide and 6.7 ft. tall, giving even the tallest of backyard warriors more than enough room to stretch out and enjoy the incredible feeling of a covered hammock swaying in a light breeze. One of the extra features that Abba really put some thought into were the plastic chain covers. We’ve routinely come across bare chains and if your hand is in just the wrong position it will pinch your skin and leave you with a nasty little blood blister. The flexible plastic chain covers eliminate that problem and provide a nice slick, hazard free chain. What really makes this one of the best covered hammock swing is the sheer durability of the unit and the robustness of the materials used. 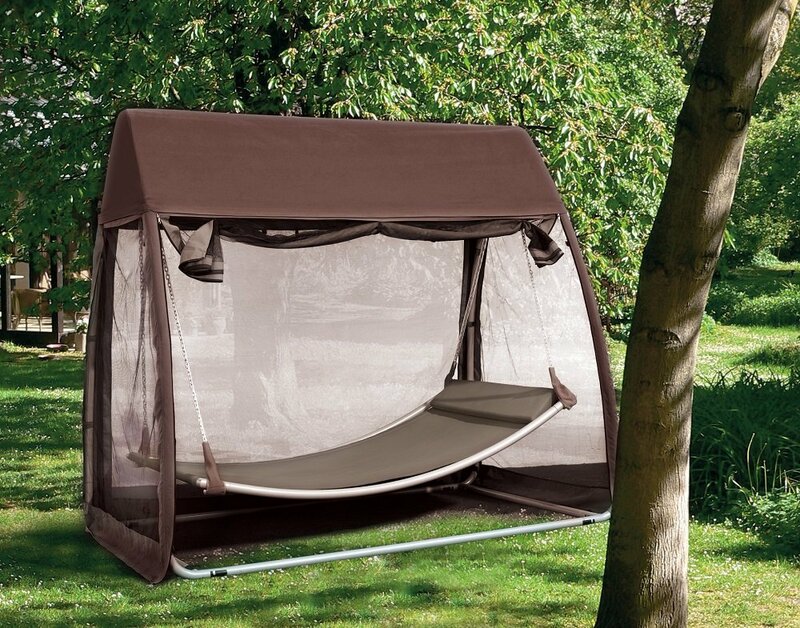 There have been many great reviews describing this Abba Patio Outdoor Canopy Cover Hanging Swing Hammock with Mosquito Net lasting for season after season under the elements with not even a hint of rust to show for it. Now after years of being outside it might get a little dirty but a quick hosing off and a scrub brush should remove any dirt fairly easily. 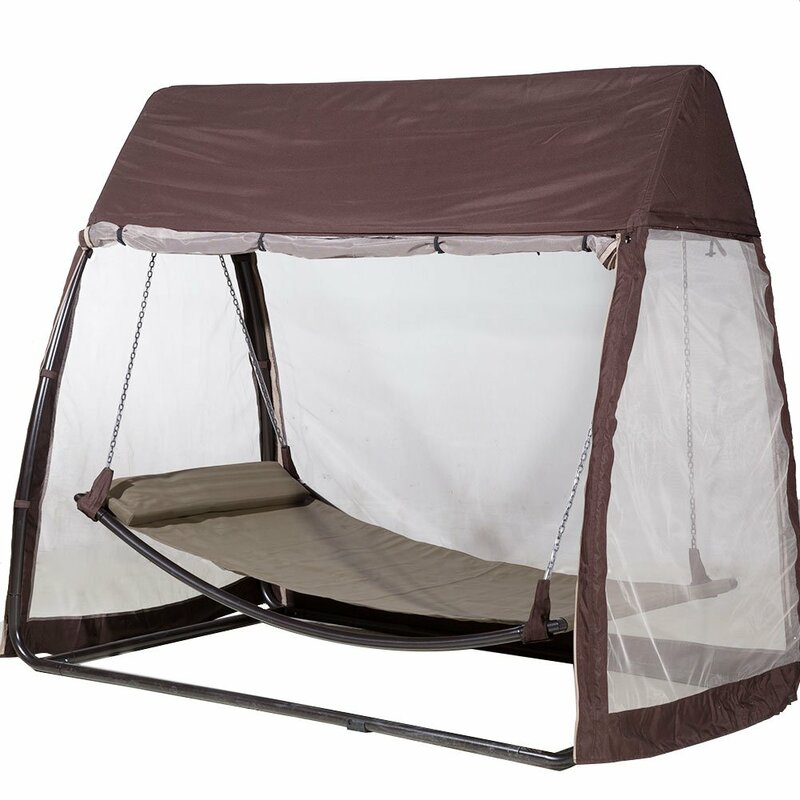 In summary, the Abba Patio Outdoor Canopy Cover Hanging Swing Hammock with Mosquito Net is one of the best covered hammock swings around. 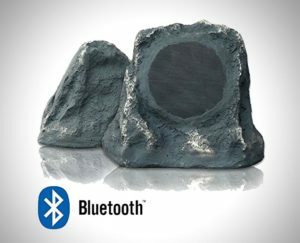 It has a robust build, high quality screen, extremely tough, yet spring material and enough space for even the largest family member. With its low price this patio hammock is very cost effective as well. If you’re looking for a perfect addition to your backyard or any outdoor location this covered hammock swing is just what the doctor ordered, plus who doesn’t love a good hammock?